By now, you've probably heard about the pending arrival of products from Tallgrass Brewing Co. of Manhattan, Kansas. The brewery has signed on with Favorite Brands for the delivery of its beers to Texas, and with label approvals now starting to appear, marketing manager Andrew Zender says it'll just be a matter of weeks before Tallgrass officially launches in the Lone Star State. Once that happens, consumers can expect to find the brewery's year-round lineup, current seasonal and selections from its Explorer Series on tap and on local retail shelves. For those looking to learn a little more about the brewery itself, Tallgrass was founded in 2007 by the husband-and-wife team of Jeff and Tricia Gill. The company gets its name from being surrounded by the Tallgrass Prairie, based on where it's located in the Flint Hills of Eastern Kansas. A move to a new facility in 2015 led the way to further expansion of the brand which, once you add Texas, will now be sold in 17 states. Supplying that footprint, Tallgrass operates a 50-barrel brewhouse set up in a 60,000 square foot building, with a 3000 square-foot portion of the space devoted to the development of the brewery's sour beer program. In terms of capacity, Tallgrass has the ability to brew up to 100,000 barrels per year (production in 2015 was 22,000 barrels), making it the largest craft brewery in Kansas, and one that has aspirations of nationwide distribution in the future. 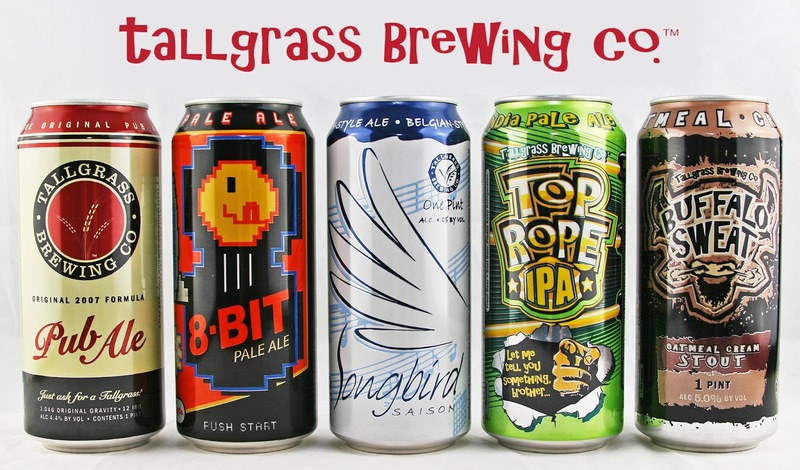 As for what North Texans can expect in initial shipments, Tallgrass sent along a sample package consisting of the following beers, so I've taken the time to provide a taste of what's to come below. 8-Bit Pale Ale: a balanced and flavorful pale ale of moderate strength, with mostly tropical fruit hop tones. Buffalo Sweat Oatmeal Cream Stout: easy-drinking stout with a smooth texture and plenty of body, featuring notes of coffee, oats and bittersweet chocolate. Pub Ale: with flavors of caramel, toasted malt and an earthy underbelly, this simple, but satisfying English nut brown ale is a session beer worthy of fridge staple status. Songbird Saison: light and refreshing farmhouse ale with a lively effervescence that mixes subtle fruit with a pinch of peppery spice. Top Rope IPA: true to form as an American IPA, this beer is bright, bitter, punchy and pithy, with classic flavors of pine and fresh citrus. Half Pipe Sour Pale Ale: tart, but not puckering pale ale that harmonizes the sour component with a bright citrusy hop character. Raspberry Jam: tasty fruited Berliner weisse that is mildly tart and not too sweet. Standards and seasonal beers will ship in 4-packs of 16-ounce cans. Differences from that include 8-Bit Pale Ale, which also comes in 12 and 24 packs of 12-ounce cans, and Buffalo Sweat, which is slated for a fall release in 12-packs of 12-ounce cans. In addition, since its nearing the end of its seasonal cycle, Half Pipe Tart Pale Ale will be draft only this time around. Regarding the Explorer Series, those beers are offered in 4-packs of 12-ounce cans, with the only exception there being Bourbon Barrel Buffalo Sweat, which is draft only. Looking ahead, keep an eye on the brewery's social media accounts (Facebook, Twitter) for details on the coming launch. Once details are set, plans are for Tallgrass representatives to travel to Texas to help introduce the brand, with events expected to occur throughout the Metroplex. Labels: distribution, Favorite Brands, Tallgrass Brewing Co.